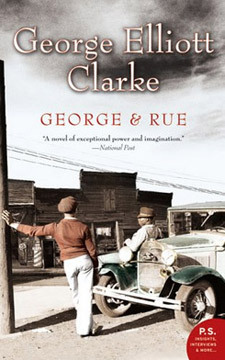 Our book for 2015 is George Elliott Clarke's George & Rue. Copies of the book are available at the Information Desk in the Hans W. Klohn Commons. George Elliott Clarke will be visiting our campus in the November. Details of the visit and other Once Campus, One Book, One Community events will be posted. Or join us on Facebook to be notified of all events. Sponsored by the Fog Lit Festival. Attendance is limited to 25. Register here. Books are available in advance at the circulation desk. Light lunch will be available. All are welcome. Pre-registration isn’t necessary. While an incredibly broad subject, the Maritimes have had their share of criminal acts of State (policy makers) vs. people(s). Panelists will share their thoughts and comments on not only historical, but current and relevant issues and struggles with the tensions inherent in Canadian society and how they manifest in social policy, modern policing. We are thrilled to have George Elliott Clarke as our special guest for the Lorenzo Reading Series. Join us Nov. 5! One Campus One Book started in 2013 and expanded in 2014 to One Campus One Book One Community. Why have a common reading program? We started the common reading program for a couple of reasons. We were looking for a way to promote reading and to get students to think of the Hans W. Klohn Commons as a place for books and reading. We also wanted to give first-year students a chance to get to know each other outside of class and feel connected.